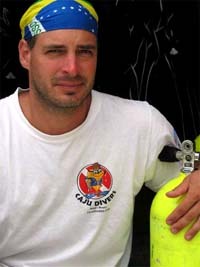 Paulistano, diver since 1986, PADI instructor since 1995 and instructor DAN (Divers Alert Network). He was from the Greek Navy serving alongside the submarine HS Triton (class 209/1200) on Salamina Island (Greece). Graduated in Publicity, worked in the magazine Diving and in several centers of diving by Brazil and by the world. Responsible for the company’s diving operation. Our PADI divecentre (Professional Association of Diving Instructors) www.padi.com, has several DIN/YOKE valve S80 cylinders, SCUBAPRO BCDs, DIN/YOKE MK2/R190 SCUBAPRO regulators, an AIRLUNG 7002 compressor, and several sets of fins mask and snorkel. Our outfit can safely and comfortably receive up to 18 divers for open water dives. Natal offers 10 excellent dive spots aproximately 10 to 12 km from the coast (about 45 minutes of navigation), the visibility being available between the months of October and June. Unfortunately, outside of this window meteorological conditions can force us to cancel dives due to improper conditions and safety issues. In such cases, the closest lagoon, Bon Fim, is often used as an alternative.